As mentioned earlier in the blog, the Bunga Terung is a deviation of the Mata Aso. Here we will look at the components individually. The Bunga Terung motif, drawn by Sonny Jumpo. 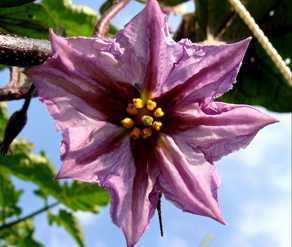 ‘Bunga’ is a Malay word for flower, and ‘Terung’ is Malay for brinjal, or eggplant. Do note that the Iban language contains many words adopted from the Malay language. The frog life cycle is significant to the Iban because of the connotation it has with the coming of age of a young man. This is represented by the coil, or ‘Tali Nyawa’. According to the diagram, on the 70th day from the frog’s existence as an egg, the tadpole would have begun sprout the beginnings of hind legs. This is drawn in comparison to the Iban custom of a young men going into the jungle alone for the first time to fulfill a certain task, most often, the hunt for the first kill. The phrase for this in Iban is ‘Berjalai’, which means to walk. As the tadpole shows readiness to begin life on land, so is young man who is ready to walk into the world as a grown man. Before the young man embarks on his journey, he will receive two Bunga Terung, one on each shoulder. The Bunga Terung should never be worn as a single design. It must be in a pair to balance and to protect both sides of the body. 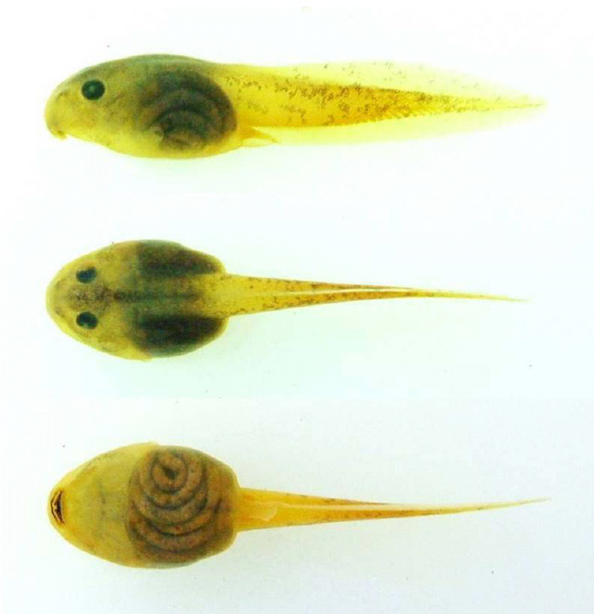 It should also be noted that it is around this stage of a tadpole’s life cycle that the fully developed and pronounced intestinal coils can be seen through a transparent belly. ‘Tali Nyawa’ directly refers to the coil, and translates as ‘Rope of Life’. 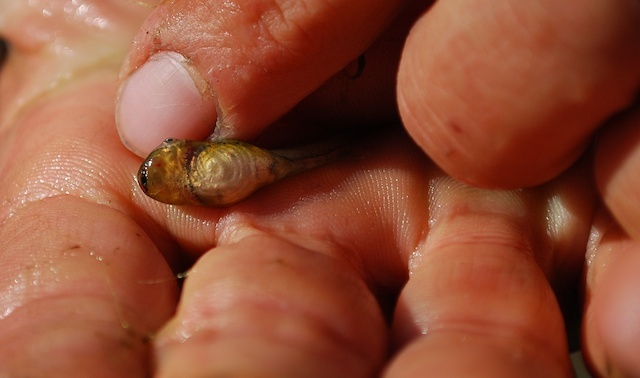 Side, top and bottom view of a preserved tadpole specimen. Picture from the Municipality of Caldas, Novas, Goias, Brazil. For the people of Borneo, as with all indigenous cultural practises of the world, getting a tattoo is closely associated with physical power and the spiritual world. 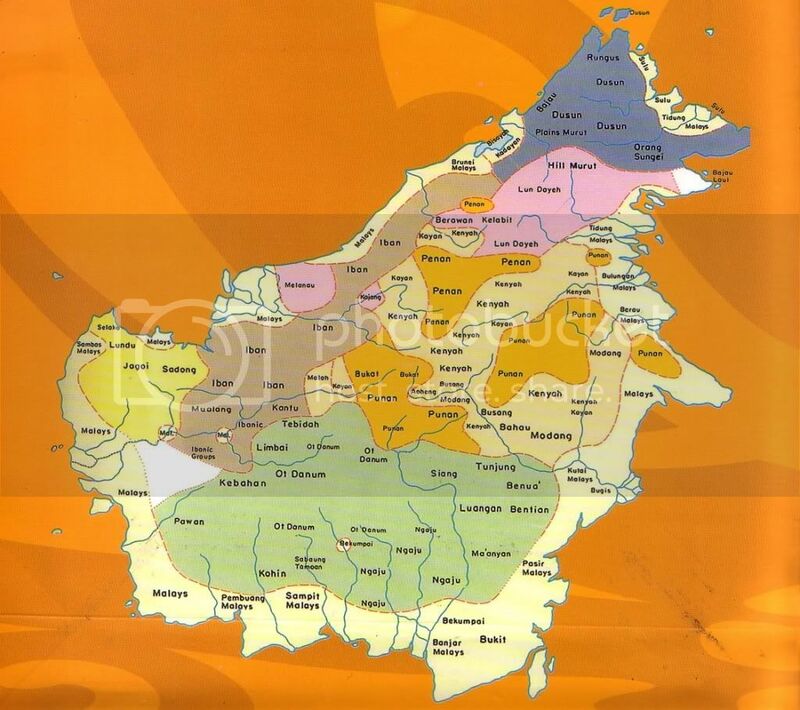 In Borneo, the major indigenous population is divided into the Iban, Bidayuh, Kelabit and Melanau (Sarawak region), the Kadazan, Dusun and Murut (Sabah Region), the Ngaju (Kalimantan region), the Kayan, Kenyah and Penan (border of Sawarak and Kalimantan), and many other smaller indigenous groups. With the exception of the Bidayuh and Melanau, the men and women of these major groups have been documented to practise some form of traditional tattooing (Sellato, B., 1989). Distribution of the major Borneo tribes, redrawn by author, based on this. To the Borneo tribes, spirits symbolise everything from animals to plants to humans. Tattoo designs contain images from nature, merging motifs of plants and animals. Artists have to seek spiritual guidance for a design. For the Kayan, it is the women who are the artists, a highly-esteemed occupation that is passed down the female line. For the Iban, it is the men who have the job of applying tattoos. Inks are made from soot or powdered charcoal, which is thought to protect against evil spirits. This yielded designs of a deep bluish black after healing. For more potency, there are cases where the tattoo colourant is mixed with ground-up meteorite shards that were found, and even the ivory of animal horns or bones (Krutak, L. 2007). Traditionally, tattooing among the Borneo people was performed in sacred rituals. For the Ngaju, the tattoo artist begins with an animal sacrifice to appease ancestral spirits. There will be ceremonial chanting before the painful process of hand-tapped tattooing that will last six to eight hours per day until the final design is achieved, which can take days, weeks or even years (Guynup, S. 2004). The Iban believed that a person’s soul resides in one’s head. This is why they practiced the trophy taking of heads in a battle (Charles H., McDougall, and Haddon A.C., 1966). They believed that by taking the head, the victim’s powers and status will be transferred to the victor. This is thought to ensure a good harvest and to nurture the fertility of the tribe. After a fruitful attack on another village, successful warriors were recognised with tattoos on their fingers, usually stylized representation of anthropomorphic animals, called ‘tegulun’. Interestingly, some Iban head-hunters had extremely detailed tattoos covering the visible surface of his body, working in effect to both empower him into battle, and to camouflage himself from spirits living in the jungle. The chests and backs of older, more experienced warriors were covered with powerful images. Hornbills were preferred because they were believed to be a messenger of the war god, at the same time symbolising rank and reputation. The scorpion and the dragon dog were used as well, to repel evil jungle spirits. The Iban women were also bestowed tattoos for producing ‘pua kumbu’, a ritual blanket or wall hanging, with powerful images, patterns and incredible intricacy. Their tattoos of accomplishments took the forms of finger tattoos, and for the more skilful and senior weaver, the form of ‘pala tumpa’, meaning ‘heads of bracelets’ (Krutak, L. 2007). Kayan girls who come into puberty received tattoos to mark them as adults of marriageable status and also for protection against evil spirits. As the women matured, the surface area of tattoos grew as well, collecting dense patterns wrapped around their legs, across the tops of their feet down to their toes, around forearms, and on fingers. However, that level of blanketed tattooed area only is only available for very wealthy Kayan women. It is because of the hefty payment involved to reward the work of the artist. Payments take the forms of swords, gongs, pigs, or beads. Only Kayan women were tattoo artists. When a Kayan warrior has taken the head of an enemy, he can have the back of his hands and fingers tattooed. But if he only played a small part in the ‘hunt, only one finger (almost always the thumb) can be tattooed. On the Mendalan River, the Kayan warriors are tattooed on the left thumb only and the thigh pattern is especially for those who have successfully brought back heads. 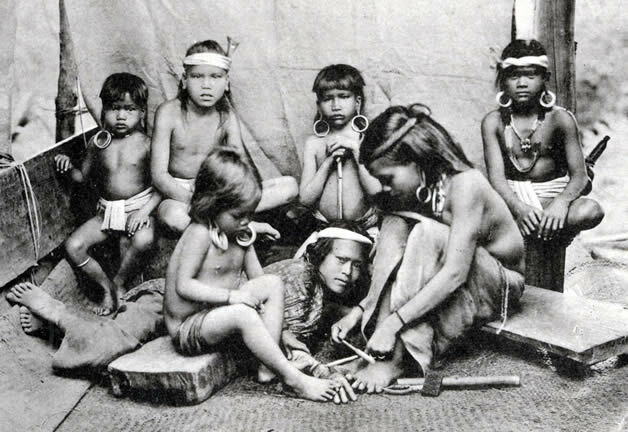 A Kayan women receiving her tattoo, surrounded other children, all females. Picture courtesy of the Sarawak Museum.